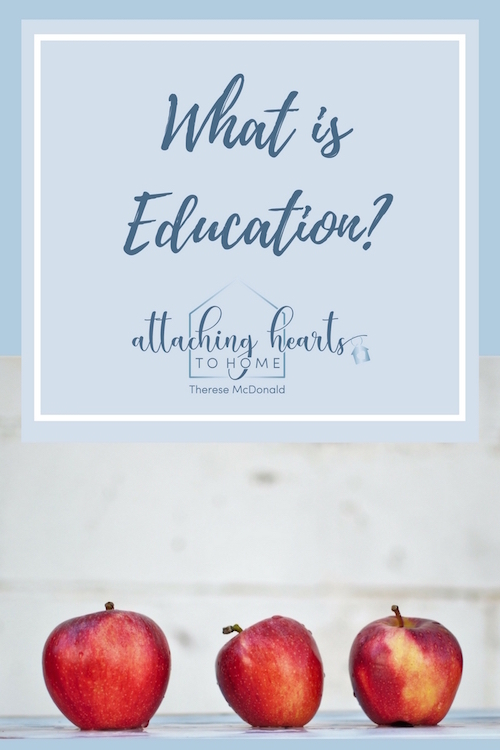 Homeschooling Series: What is Education? Education has a Latin root, "Educere". It means to lead forth or to come out. Think about that for a bit. What is education? It doesn’t mean to fill up or put in. It is about leading a child and drawing something out. My own education imprinted me. I was programmed in a system that filled me up day after day with facts, figures, and information. Therese did well at regurgitating information. Input, input, input, resulted in correct output, output, output. I was an Honours student because I knew how to perform well. Rare is the occasion I remember someone drawing the best out of me. There was the uncommon teacher who lead me forth in a non-formulaic way. I recall those few teachers who would often put the curriculum aside and take us places that left us changed forever. I remember those wonderful questions that had me thinking and responding from somewhere deeper inside of me. With my sixth-grade teacher reading aloud, in distinct voices for each character, I was captivated while he paused with meaningful queries. “What kind of man was Mr. Fogg? What makes a true gentleman? How do you think a person becomes a gentleman?” Nothing was rushed. We were allowed to think. Our thoughts mattered. Each person who expressed an opinion or idea added to the layers of wisdom as points were fleshed out. In eleventh-grade, I had a marvellous English teacher who drew out of me a love of classic literature. I didn’t know how much there was to love in Tale of Two Cities until she came into my life. Again, she wasn’t looking for cookie-cutter answers, or even the answers at the back of the book; she wanted us to ponder truth and beauty, goodness and meaning. “What does free will have to do with love? What is justice? What is revenge? What makes them different?” Oh goodness, I didn’t want those discussions to end…and frankly they never did as I continued thinking about it all on my bus trip home, and even today as I write this article. What is Education? I offer you some of my thoughts. Is a small reflection of the creative mind of God. It is far wider and deeper than mere rote answers as the learner is guided to consider possibilities beyond the mere comprehension of facts. Is an unleashing of morally sound curiosity. Children are born curious. An education should allow for life-long curiosity and exploration. Freedom to discover is essential. A fill-in-the-blank kind of education gets old, fast. Is logical and well-reasoned. Once we let relativism rule the mind, we lose the anchor of absolute truth. Children need critical thinking training. Apologetics and philosophy come in sized-down versions for even the young child. Thinking on one’s feet is a life-long skill. Is about the ability to comparing and organize. Never does this kind of education go obsolete. Employers are desperate for workers who can exercise judgement and systemize their thoughts and environment. Is found in common sense and right and wrong. A truly educated person is not easily duped, nor do they act foolishly. Taking time each day to lead forth in that what is sensible and moral, gives a young person a grounding that will take them all the way through life. Is anchored in the basics such as literacy and numeracy, and verbal and written communication. Not some wearisome and uninspiring take on these important skills, but rather approaches that are meaningful and animated. Write about what matters to you! See why mathematics is alive around you! Expression with conviction and eloquence! Discuss and converse! Read books that have stood the test of time and are rich in content. Why waste time reading twaddle? Is about finding out and learning how to find answers. It is about evaluating information and weighing it for accuracy and truth. What do I do when I’m faced with challenges or new problems? A real education makes problem-solvers out of our children. Is found in analysis and looking carefully. Children need to be observers and inspectors. As we draw the best out of them, we need to show them how to be discoverers. Is about decision-making and finding out about success and failure. Every child does well to receive a formation in wise risk-taking. Is about discernment, prayer, and trust. Every child needs to practice and learn the foundational relationship with God. Focuses on process rather than content. Content and information is available in a moment, with a click or swipe. As was once said, “Education is what is left behind when the facts are forgotten.” This is often the case. If you are looking for ways to educate in a fashion that mines for the gems in your child or spearheads them beyond the programming the system provides, talk with me. Early on in my homeschooling journey, I found out that I didn’t need to keep filling my children up. I left my own programming behind and found what real education looks like. What is one thing you can do today to draw the best out in your children? What would opening them up to the possibility of learning with full scope for the imagination look like in your home today? 5 Ways to Teach Through Discussion...and Have Fun Doing It!